We actually stopped using hope hubs in this neck of the woods as all of the xd drivers on the 2 pro would self destruct at incredible frequency. The bearings are far too small and cause the races to crack in half with big strong riders on the steep climbs we have. Hope pretended there was no problem. I actually bought a shimano driver and cassette so I could keep using an almost brand new wheel set. @danielsapp: great article! I notice you talk about taking a tooth out on your x01. What a pain, I have done this twice with x01 and have ended up having to buy yet another overpriced cassette. Back in the day I used to run a "winter" bike when I was pretending to be a racer. I could see buying this groupo for that reason. I hate the price of the sram stuff; I go through a drivetrain in entirety per year. Before you comment on how your's has lasted 25 years-I don't care! 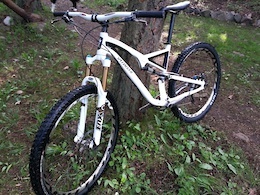 I am a 6'2" , 200lb former grass roots racer who puts big miles on from rides on the steeps of BC year round. yup, by the same logic minions are crap, because I screwed up and didn't notice I bought the EXO version of the DHR2..
Is this the end of Bike mag? Scottish Council Concerned by Mountain Bikers "Stripping Off"
I have to admit I am interested (when the price comes down to earth) just for the possibility that the damned thing wouldn't creak like an old wooden ship after a couple of weeks! @Three6ty: You have to budget buying a proper cassette for that bike though. The E thirteen is pretty nasty as it wears out incredibly fast in the first 3 gears (I killed mine in 6 weeks of normal use). Best just to buy a sram gx cassette right off and just be stuck with a shimano/sram mixed drivetrain. Then you are only worried about the E thirteen rear hub that has super fast bearing wear. The biggest thing I miss about the good ole days is that I wasn't old!